Mobile VR is going to get better. Samsung and Oculus are making sure the Gear VR keeps up with Google's DayDream VR platform. 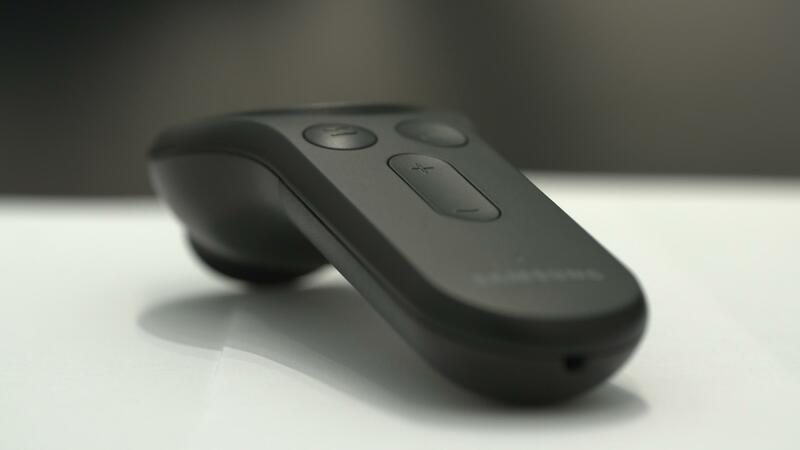 The two companies announced a new version of the mobile headset and it now comes with a controller. In fact, that's the major difference, with the headset itself being marginally lighter and benefitting from a few cosmetic tweaks. I got to handle the controller for a brief spell here at MWC, and while there were no demos for me to experience, Gear VR's take on the mobile controller feels more like the HTC's Vive peripherals than anything else. And that's certainly not a bad thing. The basic controls on the Gear VR aren't all that different from Daydream VR: a trigger button on the rear, a circular clickable touchpad, along with volume, back and home buttons. There's a groove in the controller body that makes it feel comfortable to grip. As Oculus puts it in its press release, the controller "lets you select, grab, take aim, and fire." Indeed, that's likely to be the real benefit for this new headset compared to previous Gear VR hardware. The controller offers a far more comfortable (and, we suspect, responsive) way to play and interact with VR content. Now we just have to see what shape that content takes. Seventy projects are apparently already in the works, and existing Gear VR headsets are also compatible with the controller.